I have been purchasing CBD oil online on and off for over 5 years now. During this time period, I have encountered several scams and have fallen victim to a few as well. While I regret not being vigilant at all times, the lessons I have learned taught me about the value of performing extensive research and due diligence prior to ordering CBD oil online. Unfortunately, many of these scams still thrive in the CBD oil industry to this day and are relatively easy to fall prey to. This article aims to assist you and educate you about one of the most notorious CBD oil scams around. If you have been actively searching for CBD oil online, you must have come across “CBD oil free trial” “Free CBD oil Just pay shipping” offers that promise you a FREE Sample bottle. The result is unsatisfactory as you end up paying for shipping fees, receiving low-quality CBD oil, and the company keeps sending you a monthly shipment of CBD oil resulting in monthly subscription charges on your card. To top it off, it may prove very difficult to cancel the subscription due to the unethical way these companies operate. Free trial plus shipping is a well-established customer acquisition scheme used in many industries ranging from books to health supplements. When used ethically, it can be extremely effective as it allows the company that employs this marketing method to acquire a large customer base quickly and cheaply without incurring large marketing expenses. Furthermore, if the company provides high-quality products and excellent customer support, it will be able to captivate the customers and keep them for the long haul. However, the FREE trial bottle ploy has been used for many years by shady companies. Unfortunately, this has turned the free plus shipping customer acquisition scheme into one of the most infamous scams in the health and supplement industry. Instead of focusing on manufacturing high-quality products and providing excellent customer support, these companies ship CBD oil of poor quality and abuse the gullibility and the forgetful nature of their customers and humans in general. It is very important to note that if you do not cancel your subscription within a few days of your free trial order you will receive a monthly subscription charge! This charge can be anywhere in the range from $50-100 depending on the exact CBD oil offer you opted for. Now, you might think, hey I have seen this before and I read the small print in terms and conditions. Surely, I will easily be able to cancel the subscription within a few days without any issues whatsoever! Well, you will be shocked to read this, but that is where things start going further south! Firstly, you will probably not be able to reach customer support because it basically does not exist in the corporate structure of these companies. This, in turn, might not allow you to cancel your subscription and you might have to directly contact your bank in order to have it canceled manually. Finally, these shenanigans are not accidental – they aim to discourage the free trial victim from filing claims which allow the company to keep collecting monthly subscription charges. Call the relevant company and attempt to cancel your subscription. Ask for a full refund except for the small shipping charge and threaten them with legal action. State that you will file a fraud chargeback case with your credit card company and get in touch with your state’s attorney general if you do not receive a full refund. Whether you receive a full refund or not, you should contact your bank and explain what happened in detail. The best practice is to have your existing card canceled and ask your bank to issue a new one. In this manner, you will be able to avoid any trouble in the future as the shady company will not have access to your card anymore and will not be able to apply recurring monthly subscription charges. If the scammers did not refund you in full, let your bank or card company know that you did not authorize any charges other than the shipping fees. Request that a fraud chargeback is filed against the shady company so that you can rightfully recover your money. This process is generally time consuming but effective. Do not overthink, do not indulge in self-pity and move on. Many people just want to try CBD oil and end up falling prey to unscrupulous companies that offer free trials. Every failure builds your character and makes you a better human being. However, do make sure that you inform your friends in case they are also interested in CBD oil products. It might seem a tedious task, but it will protect you from falling prey to online scams in the future. Focus on the “Terms for trial offers and subscriptions” section which is the most relevant in this case. You will thank yourself later on. Numerous websites promote CBD oil to tell the users what to buy and what not to. They do detailed video reviews and also Brand reviews. Fraudulent companies are gradually being eliminated in the CBD oil market. Nonetheless, there are still many lurking around. Some of the shady brand names that have been associated with the FREE trial bottle offers are Miracle CBD, Pure CBD, Sky CBD, True CBD, Assure CBD, Pure Med CBD, Divine CBD, Isolate Direct CBD, Organix CBD, Serenity CBD, and Optimal Choice CBD. Please do not hesitate to inform me about any other scams that you may have encountered. It is our mutual goal to protect consumers of CBD oil. 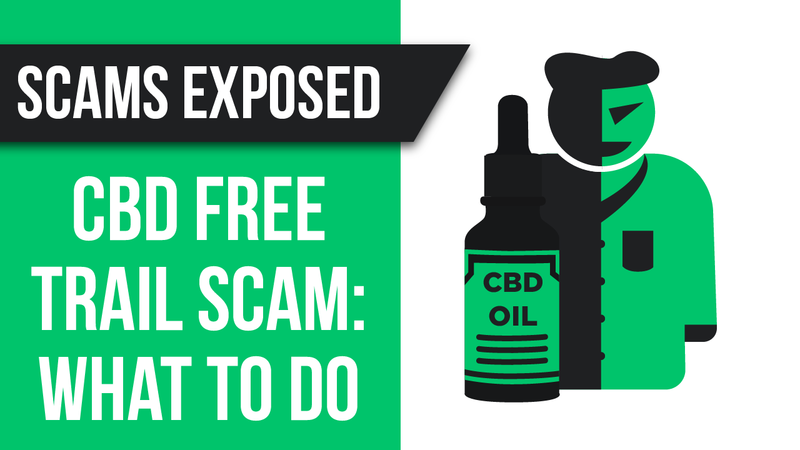 Cannabidiol 101: Ultimate Guide for Beginners 2019 > CBD Oil Free Trial Scams Exposed: What to do?